Parking in the Hammer Museum UCLA in Los Angeles, I noticed an array of expensive luxury cars that included a Rolls Royce, two Bentleys and a few Jaguars lined up in a row. They belonged to affluent winemakers, oenophiles, wine buyers and culinary aficionados for a gala evening and dinner by James Beard award winning chef Suzann Goin. 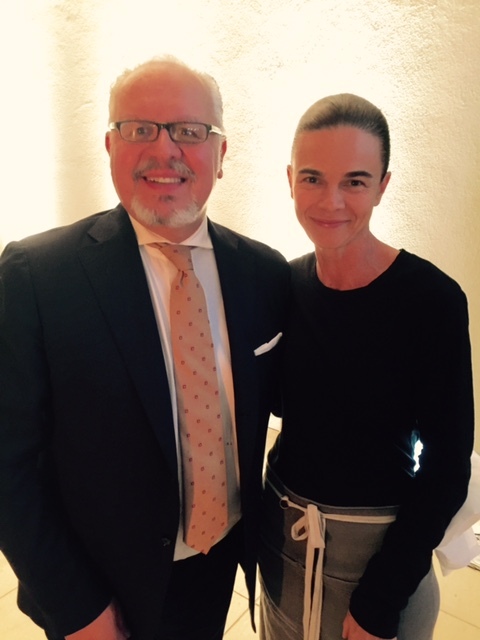 Michael Mondavi Founder, Folio Fine Wine Partners and Michael Mondavi Family Estate attended the event. He helped establish the Napa Valley wine industry to what it is today, while working with his grandfather Casare Mondavi and learning about natural farming and winemaking. James Beard Outstanding Chef Suzanne Goin with Guest. Goin and her team prepared over 150 exquisite meals for the benefit dinner during the live auction of rare Ornellaia bottles conducted by Sotherby’s in support of the Hammer Museum. Tenuta dell’Ornellaia is an Italian wine producer in the DOC Bolgheri in Toscana, known as a producer of “Super Tuscan” wine. 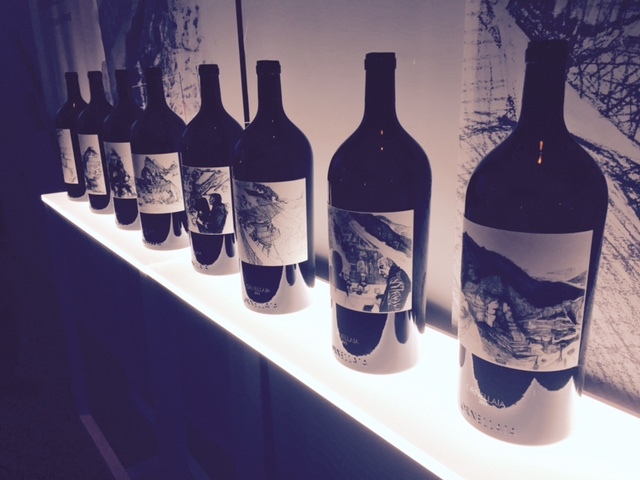 Every year since the release of Ornellaia 2006, the winery chooses a contemporary artist to create a work of art and series of limited edition labels. The inspiration is from a single word chosen by the winemaker to describe the character of the vintage. 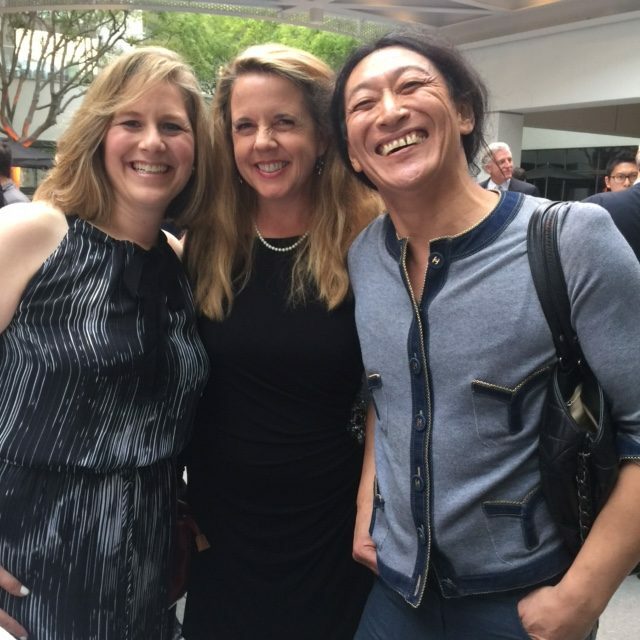 Wine expert Allison Levine, Jill Weinlein and artist Yutaka Sone. This year, the winemaker selected contemporary artist Yutaka Sone. Sone works in various media, primarily marble sculpture and crystal carving. His large blocks of marble are displayed around the world. 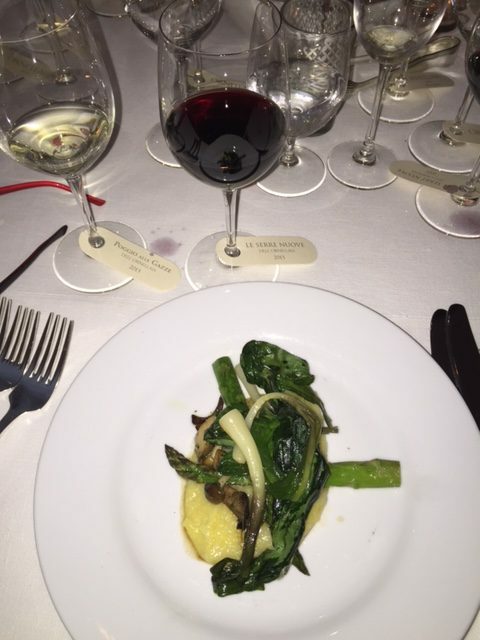 Next was a dish of polenta, sauteed asparagus wild mushrooms and ramps. 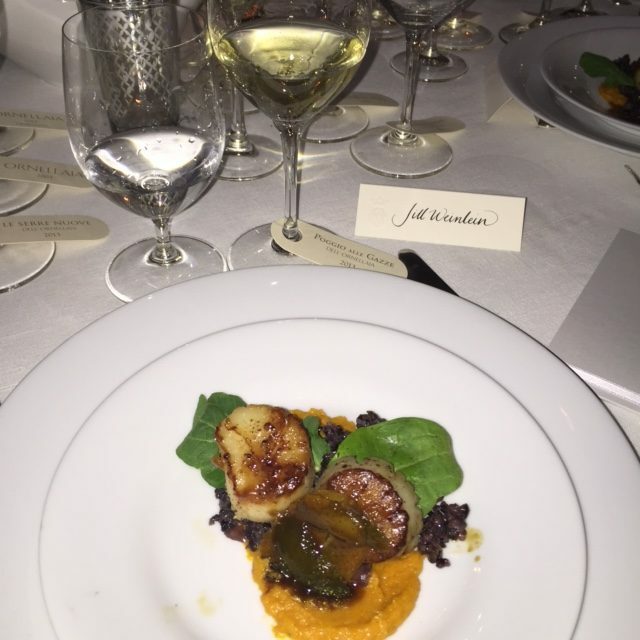 It was paired with a glass of red Le Serre Nuove Dell’Ornellaia 2013 as the Sotheby’s wine auction began. Lot 1 in the auction was a case of 6 bottles of 750 ML Ornellaia 2013 ‘L’Eleganza’ with one label created by Yutaka Sone and the lid to be signed by the artist. The starting bid was $1,800 and this lot sold for $3,300. The last lot was a 9-litre bottle of Salmanazar Ornellaia 2013 ‘L’Eleganza’ with a white marble sculpture by Yutaka Sone. The lot included an exclusive overnight visit to the Ornellaia Estate for 6 guests with a visit to the vineyard and winery, a vertical tasting of 6 vintages of Ornellaia and a dinner in a local Michelin-starred restaurant. This opened at $20,000 and sold for $28,000. 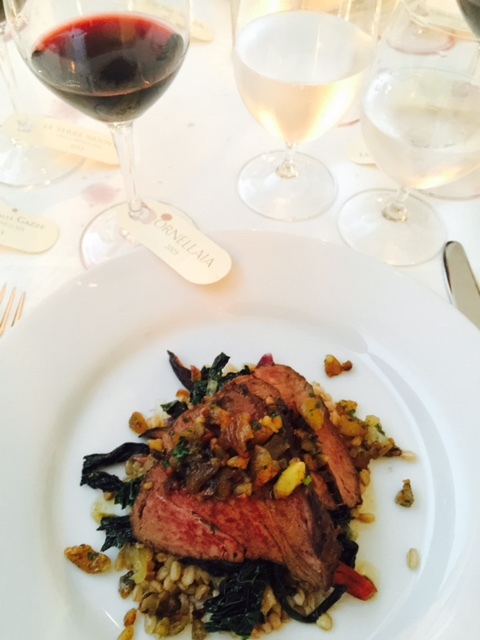 We watched this exciting auction while enjoying Goin’s entree of slow and tender beef tenderloin with heirloom carrots and sautéed kale with toasted farro and crunchy chestnuts providing an exciting texture that balanced the flavors beautifully. This was served with two red wines, the Ornellaia 2013 and the Ornellaia 2003. The 2003 was my favorite wine of the evening. The 2003 vintage had abundant ripe fruit flavors and scents of exotic spices, enhancing the rich and generous texture. It’s made with Cabernet franc and Petit Verdot giving the wine great harmony and balance. It retails for just under $200 a bottle. After the auction, Goin’s dessert was an elegant Earl Gray Pavlova with milk chocolate custard and a whipped creme fraiche on top. 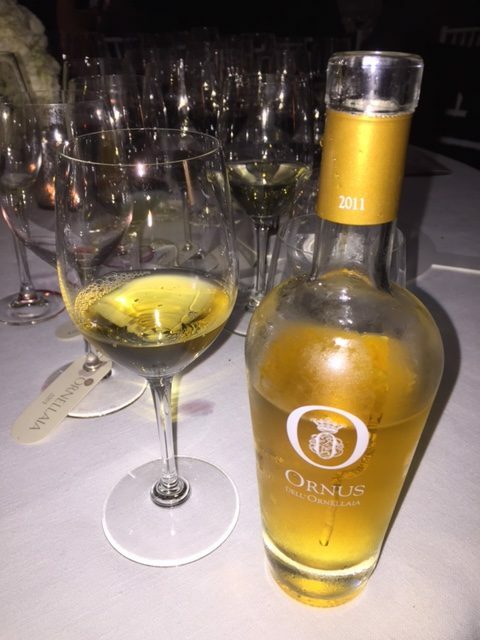 It was served with a luscious Ornus Dell’Ordellaia 2011. This sweet wine complemented the exquisite dessert. At the end of the evening, we learned that the live wine auction raised $128,100 for the Hammer Museum at UCLA. It will help host 300 free public programs a year, including lectures, readings, symposia, film screenings and music performances, thanks to Ornellaia’s generousity.